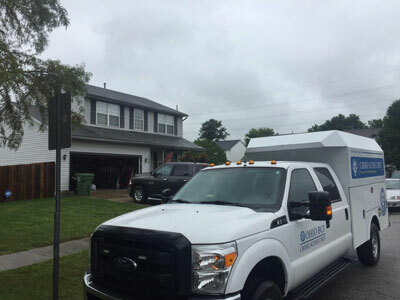 An Ohio Bureau of Criminal Investigation truck is parked outside 1338 Milstone Drive Saturday at about 3:45 p.m. after authorities found the body of Diane West in a freezer in the home’s basement. Kenneth West, the victim’s husband, was found the next day in the Columbus area dead of apparent suicide. As neighbors saw Kenneth West mowing his yard in Marysville last week, authorities believe the body of his wife, Diane West, was stuffed in a freezer inside the home. By Sunday, authorities had announced Kenneth, 47, had been found dead of an apparent suicide in the Columbus area. According to a release from the Marysville Division of Police, the daughter of the victim requested a well-being check Thursday last week for the Wests’ residence at 1338 Milstone Drive. When officers first went to the home, no one answered the door. On Saturday, Marysville Police detectives had received a warrant. Police and agents from the Ohio Bureau of Criminal Investigation (BCI) began their search of the residence after 2 p.m.
Marysville Deputy Police Chief Tony Brooks said BCI was called since several concerning factors intersected. Nobody received contact from Diane, 68, for several weeks, her texts seemed suspicious and Kenneth could not be located. Authorities found her body in a small chest freezer in the basement. Lance Emberling, an investigator with the Union County Coroner’s Office, said it’s estimated she had been dead for anywhere from three to six weeks. The body was sent to Montgomery County for an autopsy. Emberling said the freezer had to be transported, and authorities had to wait for it to thaw. As of this morning, officials are still waiting for results. “I’m hoping that they’ll be able to do that today or tomorrow,” Emberling said. Emberling said there were no “signs of a struggle or anything like that” in the home. He also said there were no signs of trauma on the body, though he noted that authorities would likely have a better idea of possible harm to Diane after the autopsy. After the body was found, police began a search for Kenneth. During this time, Brooks said authorities received many tips from those who claimed to have seen him. Kenneth was found dead in a hotel in Galloway Sunday, according to Emberling. He said Kenneth appeared to have committed suicide with a gun and left a note. According to a second release from Marysville Police, the Columbus Division of Police are investigating Kenneth’s death. At the time of the release, charges of abuse of a corpse were pending for Kenneth. The release states additional charges would have likely followed after the autopsy. Neighbors of the Wests described the immediate area as a relatively normal, friendly neighborhood. Many described the Wests as the most withdrawn household on the street. Christopher’s father, Chris, said Kenneth would exchange pleasantries. If someone said “hi,” he’d say it back. He was reportedly “very particular” about his yard work, according to Chris. However, the Wests seemed introverted. Neighbors at 1335 Milstone Drive, a husband and wife who asked to remain unnamed, echoed those statements.